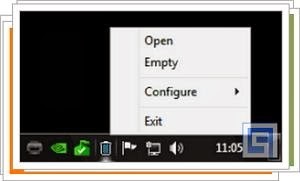 MiniBin is a compact recycle bin, tiny icon that will appear in your task bar, right next to the time. It is designed for Windows operating system, which can remove the recycle bin icon from your Desktop and make a new icon on your system tray. In some ways, MiniBin behaves like the classical Bin: The icon changes appearance depending on whether full or empty, and a right click gives access to options (only two). A double-click on MiniBin, on the other hand, empty the trash folder instead of opening it. MiniBin is a simple and lightweight accessory, highly recommended for those who do not want icons on the desktop.